"McCarthy wins the award after securing an impressive 13 points from a possible 15, which has pushed them up the table and into sixth place. Town defender Mings has been crucial to Ipswich's September success, with the 21-year-old offering an attacking threat alongside his defensive qualities. The judging panel for the awards comprises Sky Sports' Football League expert Don Goodman, Football League Chief Operating Officer Andy Williamson, Football League Head of Communications John Nagle, League Managers' Director Olaf Dixon and Sky Bet Football Trading Manager Paul Lowery." A superb September has seen McCarthy's side fly up the table, having secured four wins and one draw from five games while conceding just two goals in the process. 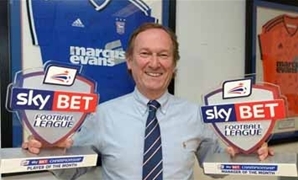 Sky Bet Football League September awards!